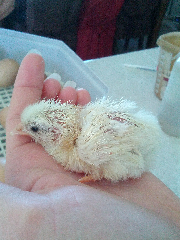 <p>We've been incubating Rhode island red x's for friends and to make up and even 2dozen they threw in an egg from their resident house chook miss jenny penny a cheeky and bossy leghorn bantam. She rules the roost and even sits at the table in their sun room... so guess who's egg hatched 1st! And just a demanding as her man she's been chirping ever since. Let's hope the rest hatch out as healthy.